Almost all the kids I know loved the LEGO Movies. 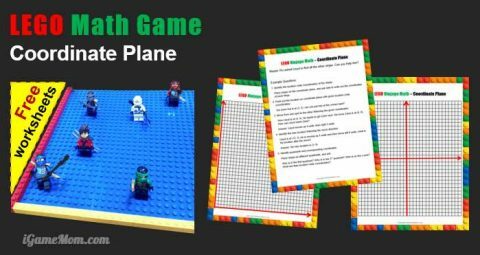 When the 2nd one LEGO Batman Movie released, I found this free LEGO Movie STEM Challenge from Scholastic. I loved the activity ideas, so I designed several extension activities to add to it. 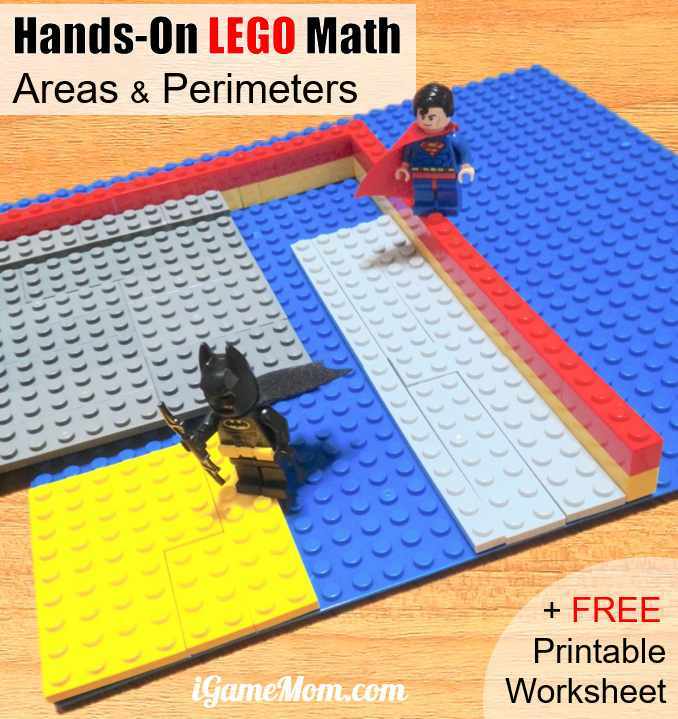 Today I share this one to go with the Lesson 1 in Scholastic’s activities, Super Hero Math. It help kids learn geometry concepts like area and perimeter, practice measurements of length, calculate rectangle area, use 2-digit addition and multiplication. Kids also practice solving word problems. Lastly and most importantly, it encourages problem solving skills. You can see from the problems below. At the bottom of this post, you can find a download link if you want to print out the whole set of problems on a worksheet for your kids to use. Batman and Robin gave up the garage idea. Instead, they are adding a new fitness room in the Batcave. To have all the equipment fit in the room, it needs to be at least 15 feet long, and 15 feet wide. In the meantime, they want to keep the bike station and acrobat mat. 1. Is the Batcave big enough for the fitness room? 2. If it is not big enough, how much do they have to expand the cave towards east and north in order to add the fitness room and be able to have the equipment they wanted? 3. What is the biggest size of the fitness room they can have without expanding the cave? Are the 3 questions too easy? You can add some more to the activity by adding more questions. 4. If they decided to get rid of the acrobat mat, will they be able to add the fitness room without expanding the cave? 5. If they take the acrobat mat out, keep the cave’s east and north walls and use them as walls for the fitness room, how many walls they need build for the fitness room? How long in total are the walls they have to build? 6. The cost for the wall is $9 per foot. How much will the fitness room cost them? Assume they will fly in and out of the room through the roof, so no doors and roof are needed for the room. 7. What is the area of the fitness room? If you download the free worksheets, you will see a couple more questions for kids. For hands on kids, you can definitely have them build the scenario with real LEGO. 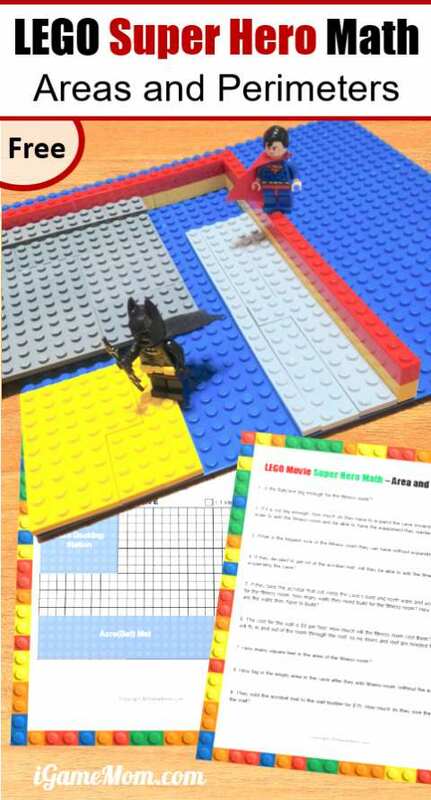 To match the design on the worksheet, you do need a LEGO baseplate of minimum size 25×18, because this is the size of the Batcave on the worksheet. 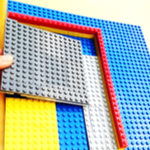 A typical baseplate of 10×10-inches is 32×32. If you have a plate bigger than 25×18, you can ask kids to build the cave as the first step. 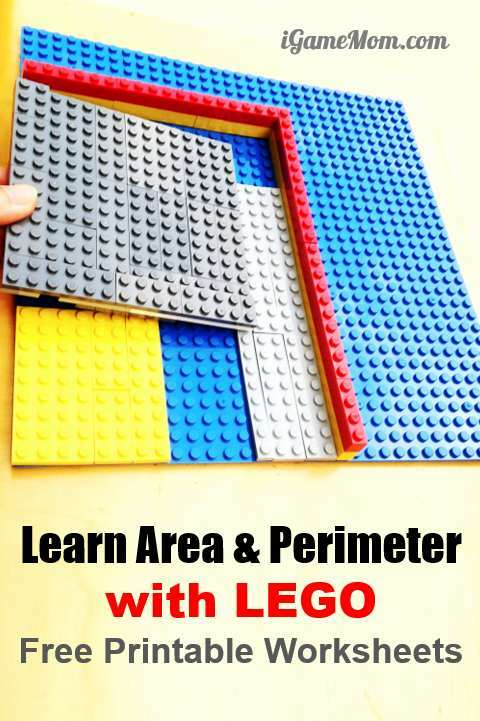 This makes the transition between worksheet and LEGO set easy. Kids can build the answers to all the questions. We even build a LEGO square that is 15×15, so kids can easily see if it will fit in the Batcave. An easy and fun way to ask them to verify their calculation is to count the LEGO units along the wall. You can also have kids cover the floor of the fitness room, bike station, and free area with LEGO of different colors. Then have kids count the LEGO units of each color. The number of LEGO units covering the fitness room should be the same as the calculated result for room area. You can download the worksheets by filling the form below. After you click the “Send Me the Worksheet” button on the form, you will receive an email with an download button in the email. 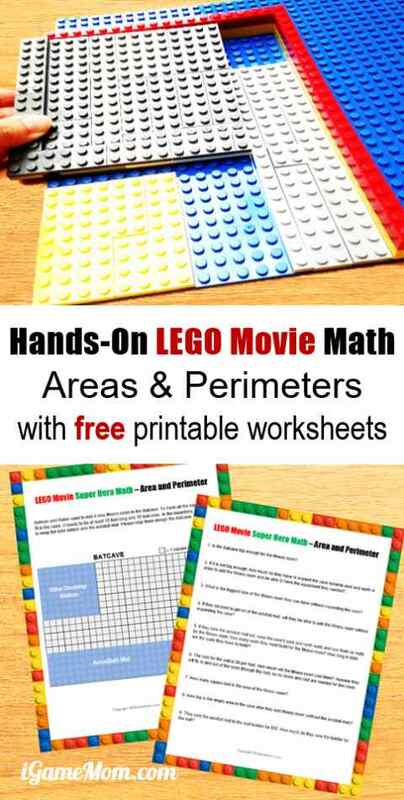 Looking for more LEGO Math activity ideas? Looking for more math resources for school age kids? 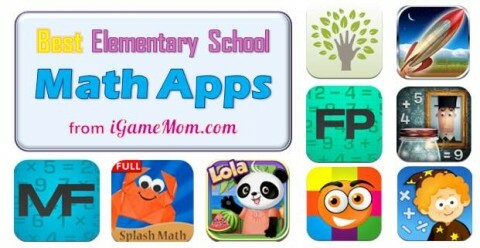 Check out 45 Math Games Grouped by Age and Learning Objectives, Best Math Apps for School Age Kids, Best Math Learning Tools for Kids.